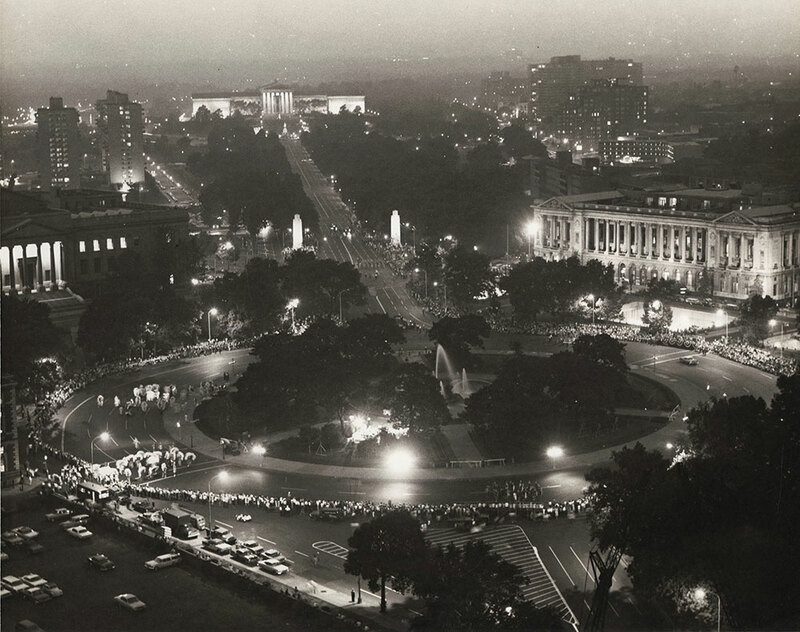 This 1964 aerial view of the Benjamin Franklin Parkway in the evening shows a gathering and parade, centered around Logan Circle, and complete with a festooned grandstand on the right and costumed groups of paraders (Mummers?) on the left. Given that the date of the photograph is July 1, this was probably a kick-off event for the 4th of July weekend. Also prominently lit and visible are the Parkway Central Library (right), the Franklin Institute (left), and the Philadelphia Museum of Art (top). The two lit pylons straddling the Parkway comprise the Civil War Soldiers' and Sailors' Memorial.